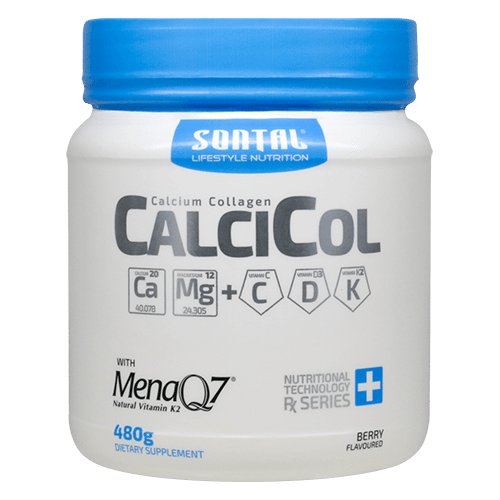 SONTAL CalciCol Calcium & Collagen Multi-Nutrient Supplement for reducing your risk of developing osteoporosis, osteoarthritis. Collagen also helps maintain healthy skin by preventing deep wrinkles and fine lines, moisturizing the skin and make it firm & supple. Payment options during checkout: (1) Pay securely online. (2) Pay via EFT after placing your order. Why SONTAL CalciCol – Calcium & Collagen? SONTAL CalciCol can reduce your risk of developing Osteoporosis & Osteopenia, also known as the “silent epidemic” because there are usually no visible symptoms. Bone is a living substance comprised of a hard outer shell (Calcium) and spongy inner tissue matrix (Collagen). The entire skeleton is replaced approximately every seven years. 1 in every 3 women and 1 in every 5 men in South Africa will develop osteoporosis at some time in their life. This is a serious systemic disease causing your bone to lose density, strength and flexibility. This can result in serious and life changing bone fractures in especially the spine, hip and wrists. These fractures can result in extreme pain, immobility and in some cases even death. Prevention and treatment include doing regular exercises, taking calcium, vitamin D, vitamin K2 and other important minerals and vitamins as well as other osteoporosis medications, if needed. In addition to building bones and keeping them healthy, calcium helps our blood clot, nerves send messages and muscles contract. About 99 percent of the calcium in our bodies is in our bones and teeth. Each day, we lose calcium through our skin, nails, hair, sweat, urine and feces, but our bodies cannot produce new calcium. That’s why it’s important to try to get calcium from the food we eat. When we don’t get enough calcium for our body’s needs, it is taken from our bones, resulting in bone loss. Collagen makes up 90% of the organic matrix of bone. Type I collagen fibers twist around each other in a triple helix and become the scaffold upon which minerals are deposited. Collagen peptides have been shown to stimulate the production of collagen by bone cells, leading to higher levels of new bone tissue formation. Collagen is the matrix upon which calcium is deposited and is also responsible for the flexibility of bone. Peptan has in addition been scientifically proven to promote bone mass density and increase bone strength in in-vivo studies. According to the World Health Organization, after the age of 50, 10% of men and 18% of women have problems with joint health. Adequate vitamin D intake is important for the regulation of calcium and phosphorus absorption in the intestines, maintenance of healthy bones and teeth. Vitamin D is required to maintain normal blood levels of calcium and phosphate, that are in turn needed for the normal mineralisation of bone, muscle contraction, nerve conduction, and general cellular function in all cells of the body. Vitamin K2 is essential for bone formation. Osteoblasts, the cells responsible for BUILDING BONE tissue, produce the protein osteocalcin. Osteocalcin binds calcium to the bone matrix and are dependent on Vitamin K to function properly. Vitamin K is therefore critical for bone-forming (calcium absorption) and also inhibits Osteoclasts from breaking down bone (calcium reabsorption). Vitamin C is essential for collagen synthesis and bone matrix quality. The organic matrix is an integral aspect of bone quality and health. Vitamin C deficiency is associated with defective bone matrix production, both quantity and quality. More specifically, ascorbic acid deficiency impairs collagen synthesis, the hydroxylation of collagenous proline and lysine residues, and osteoblastic adhesion to bone matrix. In observational studies, vitamin C intake and status is inconsistently associated with bone mineral density and fracture risk. Improving the collagenous bone matrix will enhance the efficacy of mineral supplementation to counteract bone loss. It is a critical component of our skeleton, with 50-60% of total body Mg found in bone. Mg also serves a regulatory role in mineral metabolism. Calcium and magnesium have a complicated relationship. The human body needs adequate levels of magnesium in order to properly use calcium, and magnesium deficiency affects calcium metabolism. New research shows calcium needs phosphorus to maximize its bone-strengthening benefits, and taking a lot of calcium supplements without enough phosphorus could be a waste of money. More than half of all bone is made from phosphate. Study shows both calcium and phosphorus are needed to support any increase in bone mass, and a calcium supplement that contains phosphorus would be preferable to one that provides calcium alone. The major component and an essential ingredient of human bones and teeth is a mineral form of calcium and phosphorus called hydroxyapatite. It is hydroxyapatite that gives bones and teeth their rigidity. While calcium is the most prevalent element in bone, bone diseases (such as osteoporosis) are due to more than just a lack of calcium. Phosphorus are also critical to maintaining healthy bones. Zinc is known to play an important role in the bone remodeling cycle. Where it is involved as a cofactor for proteins involved in deposition and resorption of the bone matrix; plays a regulatory role; and is involved in the structure of the bone itself. Zinc stimulates bone building osteoblasts, and inhibits the function of bone resorption by osteoclasts. There are many causes of bone mineral density loss (see prevention of osteoporosis) and it has been reported that one of the reasons for bone growth retardation is a zinc dietary deficiency. It has been reported that as people age they are less able to absorb nutrients as efficiently as younger people. The combination of these two factors can lead to a negative impact upon bone health. Copper is an essential trace mineral which play an important role in bone health maintenance. Copper aids in the formation of collagen for bone and connective tissue and contributes to the mechanical strength of bone collagen fibrils — the long thin strands of proteins that cross-link to one another in the spaces around cells. Copper also helps inhibit bone resorption through a copper- and zinc-containing antioxidant called superoxide dismutase. This antioxidant neutralizes superoxide radicals produced by the bone-breakdown cells called osteoclasts during bone resorption. Directions for use: As a dietary supplement adults should take 1 (one) 15g serving, any time during the day. Add to 200 ml cold water and mixed until fully dissolved. Drink immediately after mixing. Enjoy a great tasting drink and get all the nutrients essential for bone health. Disclaimer: This product is NOT intended to diagnose, treat, cure or prevent any disease. Only take as directed. Do not take more than the recommended dose. It is meant to be used as directed. If you have any sensitivity to herbal products, consult your physician before taking this product. A small number of people may experience allergic reactions to certain herbs.